We had our 1st Chamber Music Concert at Grace on Sunday, April 14 and it was a great success. We had Colloquial Winds along with Michael Shingo Crawford and Phillip Wats on violin as well as our own John Ervin on the organ. After the concert everyone enjoyed the reception where they could meet the musicians. Mark your calendars for our next Free Concert which will be on Sunday, October 13, 2019. Sunday, April 7, 2019 – There will be a Council Meeting immediately following the worship service in the meeting room downstairs. Please plan to attend. Wednesday, April 10, 2019 – Bible Study lead by Pastor Richard will begin at 11:30. We will be studying the Gospel of John. Please feel free to bring a brown bag lunch and a friend. We will meet in the downstairs meeting room. Sunday, April 14, 2019 – At 3:00pm we will be having a Free Concert of chamber music which John Ervin has put together. We will have a woodwind quintet as well as violinists along with our pipe organ. This is open to the public so please invite your friends and relatives. Lite refreshments will be service in the undercroft so you can meet the musicians after the concert. Monday, April 15 through Monday, April 22, 2019 – Nursery School is closed for Easter break during Holy Week and on Easter Monday reopening on Tuesday, April 23rd. Palm Sunday, April 14th – Worship Service at 10:00 a.m. at Grace. Thursday, April 18, 2019 – Maundy Thursday service with Holy Communion 7:00pm at Grace. Friday, April 19, 2019 – Good Friday Service at 7:00 at Grace. Sunday, April 21, 2019 – Easter Sunday please join us at 8:30am for and Easter Breakfast prepared by the men of Grace Lutheran Church. After breakfast join us for an Easter Service of Holy Communion at 10:00am followed by and Easter egg hunt for the children. Colloquial Winds, a woodwind quintet, along with violinists Michael Shingo-Crawford and Phillip Watts will present a Chamber Music Program at Grace Lutheran Church, Mather Avenue at West Chester Pike, Broomall, Pennsylvania on Sunday, April 14 at 3 pm. Featured on the program will be woodwind quintets of Franz Danzi, Claude-Paul Taffanel and Michael Singo-Crawford, as well as the Double Violin Concerto by Johann Sebastian Bach. Colloquial Winds was founded in 2018 in Philadelphia. Its members are students of Temple University with a commitment to the cultivation and performance of standard works as well as new music. 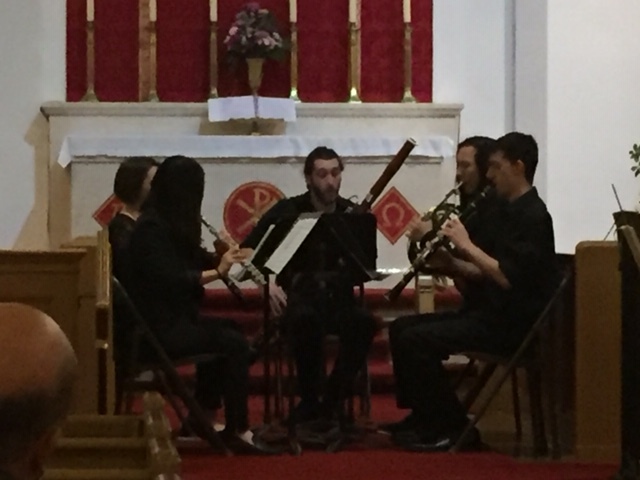 They recently performed at the Skidmore Wind and Brass Festival and had an opportunity to work with members of Windscape, the resident woodwind quintet at the Manhattan School of Music. Michael Shingo-Crawford, composer and award-winning violinist whose woodwind quintet will be featured, will play the Bach Double Violin Concerto with Phillip Watts, who regularly plays in local orchestras and is a member of the Shrewsbury String Quartet. The concert is free to the public. Light refreshments will be served following the Program for those wishing to stay and meet these accomplished musicians. 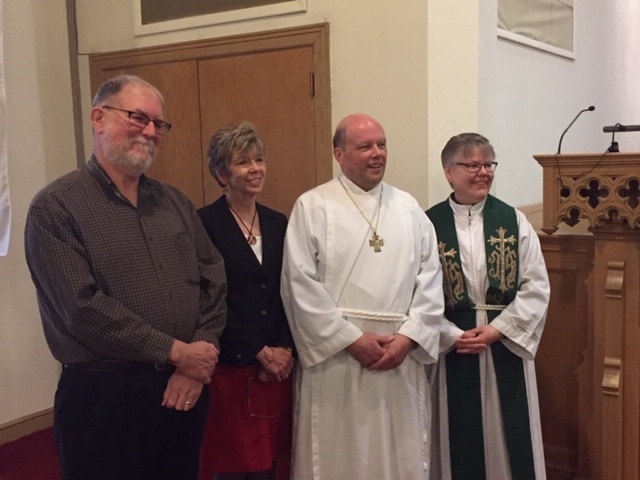 Welcoming a new member to Grace – left to right – Keith Jones, Council President, Sue Roberts, sponsor, Kevin Hartman our newest member and Pastor Leslie Richard. March 2019 – The Altar Guild will be taking orders for Easter Lilies and/or Tulips. Plants are $10 each. Please fill out both sides of an order form and return it to the church office or place it in the offering plate by March 31st with your check made payable to Grace Lutheran Altar Guild. Plants can be picked up after the Easter morning worship service. Thank you for helping to beautify our church this Easter! Wednesday, March 6, 2019 Ash Wednesday Service with Holy Communion is at 7:00pm. Sunday, March 10, 2019 – Daylight Saving Time begins at 2:00 a.m. Please remember to turn your clocks ahead one hour before you go to bed on Saturday night. Sunday, March 10, 2019 – We will be having a service to honor all First Responders at 10:00 a.m. The new American flag and Lutheran flag which were bought by Linda & Butch Wetzel in memory of Karl Dorschu will be dedicated Sunday, March 10th during the worship service. Also on March 10th there will be a Council Meeting immediately following the worship service. Wednesday, March 13, 2019 –we will be feeding the homeless. If you are able please come around 9:30 in the morning to help prepare the food and/or come at 6:15 p.m. to help deliver and feed the hungry. Monday, March 18, 2019 – Synod Conference Executive Committee will be meeting at Grace at 6:00pm. Wednesday, March 20, 2019 – First Day of Spring! Wednesday, March 20, 2019 Grace will be hosting the mid-week Lenten Soup, Salad & Bread dinner at 6:00pm. Please use the sign-up sheet in the Narthex and let us know if you can make a pot of soup, dessert, or help set up or clean up. Marple Newtown Clergy Association Interfaith Schedule of Services with soup, salad, bread & dessert dinner.Each Wednesday the dinner will be at 6:00 p.m. & the Worship Service will be at 7:00 p.m.
Wednesday, March 13th – Mid-week Lenten Service at – Church of Jesus Christ of Latter Day Saints, 721 Paxon Hollow Road, Broomall. Wednesday, March 27th– Mid-week Lenten Service at – Trinity Christian Reformed Church, 144 Lawrence Road, Broomall. Wednesday, April 3rd – Mid-week Lenten Service at – Marple Presbyterian Church, 105 N. Sproul Road, Broomall. Wednesday, April 10th – at St. Mark’s United Methodist Church, 2220 S. Sproul Road, Broomall. FEBRUARY 2, 2019 – There will be a Celebration of Life Service for Karl E. Dorschu who was called into eternal life on January 19, 2019. There is a calling hour at 1:00pm followed by the Service at 2:00pm which is then followed by a reception in the undercroft of our church. Please come and join Jean and the entire Dorschu family to celebrate Karl’s life. FEBRUARY 2019 – Jan Carrara will be handing out clear plastic bags to be filled with personal items for the homeless. These bags will need to be filled and returned to church as by Sunday, February 10th so they can be delivered on Thursday, February 14th. Items needed: shampoos, conditioners, brushes, combs, deodorant, disposable razors, shaving cream, tooth brushes, tooth paste, mouth wash, feminine items, etc. Sunday, February 10, 2019 – Council meeting will take place immediately following the worship service in the meeting room downstairs. Friday, February 15, & Monday, February 18, 2019 – The Nursery School will be closed for President’s Weekend. Nursery School will reopen on Tuesday, February 19th. 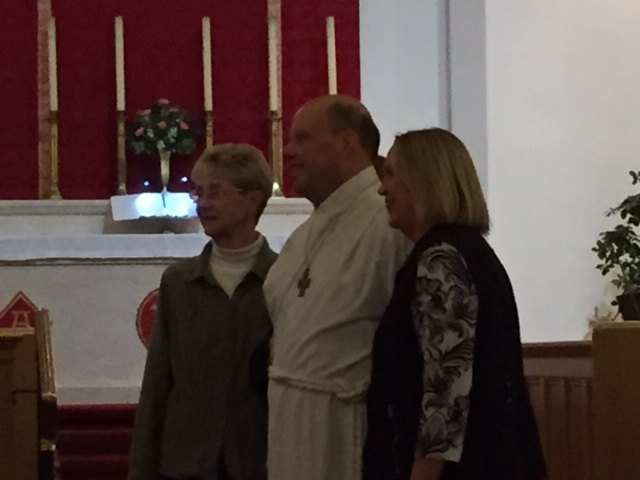 Sunday, February 24, 2019 we welcomed a child of God to the family of Grace Lutheran Church. Wednesday, March 6, 2019 – We will have Ash Wednesday Service at 7:00pm at Grace with communion and imposition of ashes for those how would like to receive ashes. Wednesday, January 2, 2019 – The Nursery School will reopen after the Christmas Vacation. Sunday, January 6, 2019 – We will be un-decorating the church immediately after the worship service. Please plan to stay and help. Wednesday, January 9, 2019 – We will be feeding the hungry. If you are able please come around 9:30 in the morning to help prepare the food and/or come at 6:15 p.m. to help deliver and feed the hungry. Sunday, January 13, 2019 – We will have our Annual Congregational Voters Meeting immediately following the worship service. Please stay for this important meeting. Thursday, January 17, – Monday, January 21, 2019 – Pastor Richard will be on vacation. Pastor Arden L. Krych will be with us that Sunday to lead us in worship. Pastor Krych is retired from St. Matthew Lutheran Church in Springfield, PA. Should you need emergency pastoral care during Pastor Richard’s absence please contact the church office. Monday, January 21, 2019 – Nursery School will be closed for Martin Luther King, Jr. Day. Nursery School will resume on Tuesday, January 22nd. Pipe Organ Update. We are in the process of upgrading and enhancing our pipe organ. We recently purchased 490 pipes from The Church of the Epiphany in Royersford, PA. The church has been decommissioned and the organ was available. 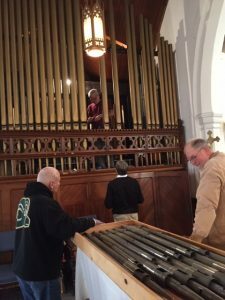 Keith Jones, Butch Wetzel, John Ervin, and Dave Ehret traveled to Royersford and under the direction of Peter van der Spek (the organ fixer) removed the organ pipes needed to enhance our instrument. This will add the oboe and stringed voices to our organ and hopefully keep it in tune longer. It appears that the next steps are to clean these pipes (volunteers needed) and add them to our existing rank of pipes early next year. Your continued support for our music at Grace has made this possible – so again, many thanks to those who contributed to our organ fund. November 2018 – As in the past, we are collecting unwrapped gifts for the children of Silver Springs Martin Luther School. 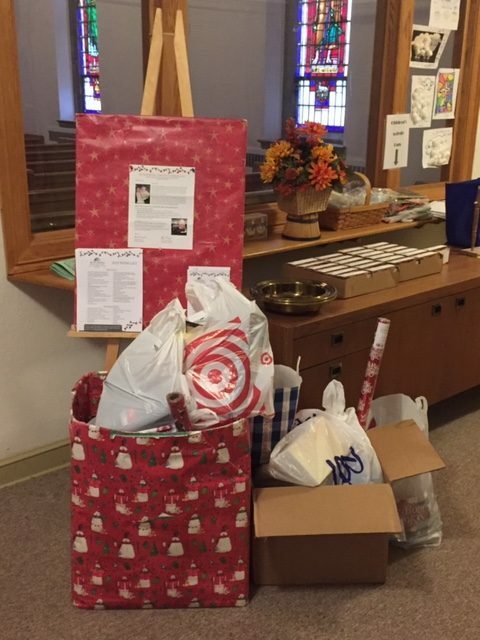 There is a box in the Narthex to fill with gifts, rolls of wrapping paper and tape. If you are not able to shop but would like to help please make your check payable to Grace Lutheran Church and mark it on the memo line for Silver Springs. Thank you for your support. All gifts should be in by Sunday, November 25th. Saturday, November 3, 2018 – Don’t forget to turn your clocks back one hour before going to bed. Daylight Savings ends at 2:00a.m. on Sunday November 4th. Sunday, November 4th – December 9, 2018 – We will be taking orders for Poinsettia Plants. We will have red or white plants at $10.00 each. All orders for Poinsettia Plants will be due no later than Sunday, December 9th. Plants can be picked up after the Christmas Eve service. Wednesday, November 14, 2018 – We will be preparing food to feed the hungry in the morning around 9:30 and then taking it to the shelter and meeting at church around 6:15p.m. If you have any old but usable coats, sweaters, sweatshirts, etc. that you want to donate to keep these people warm during the winter months please bring them in and they will be taken to the shelter the evening of Wednesday, November 14th. Sunday, November 11, 2018 – There will be a Council Meeting in the meeting room downstairs immediately following the worship service. Tuesday, November 20, 2018 – Marple Newtown Community Thanksgiving Service will be at Church of Jesus Christ of Latter Day Saints, 721 Paxon Hollow Road, Broomall, PA at 7:30p.m. Father Banecker from St. Pius will be the main speaker. It is hoped that there will be two choirs, an adult and a children’s choir. Please let Pastor Richard know if you are interested in participating. We are being asked to cook two turkeys, debone and deliver them to St. Anastasia Tuesday, November 20st between 3 & 4 pm or bring them ½ hour prior to the service that night to the Church of Jesus Christ of Latter Day Saints. Please let Pastor know if you are able to help by cooking a turkey for the hungry for Thanksgiving. The congregations of Marple Newtown are invited to bring collections of new hats, gloves and scarves to the community Thanksgiving Eve service on November 20st. These will be distributed to persons in need in our community. Your donations may be brought to the church office before that date, or bring them with you to the service that evening. Wednesday, November 21st – We will be having a Red Cross Blood Drive from 1:00 – 6:00pm. If you are able to donate please let us know what time is good for you. Please ask your family, friends and neighbors to come out and help support the Blood Drive! This is a time of year when donations of blood are needed! There is a signup sheet in the Narthex if you want to help by donating blood or call the church office at 610-356-1824 and leave a message with the time you are available and we will return you call. Wed., Nov. 21 – Fri., Nov. 23, 2018 – Nursery School will be closed for the Thanksgiving Holiday. Nursery School will reopen on Monday, November 27th. October 1 through Sunday, November 25th – We will begin collecting money and gifts for the children of Silver Springs Martin Luther School for Christmas Sunday, October 9th. There will be a box in the Narthex for the toys/gifts and we will have a wish list for the children including stocking stuffers. We will collect these items starting October 1st and all gifts must be in by November 25th. Nothing can be wrapped but if you wish to donate wrapping paper and tape they also will be greatly appreciated. If you would like to donate money please make your check payable to Grace Lutheran Church and mark Silver Springs on the memo line. Wednesday, October 10, 2018 – Bible Study led by Pastor Richard will be held in the meeting room downstairs and we will be continuing to study the gospel of John. Please feel free to bring a brown bag lunch and a friend. We start around 11:30 a.m.
Saturday, October 13, 2018 – Please join us from 9:00a.m. to 2:00p.m. for our Annual Bazaar. If you are able to make homemade soup or homemade baked goods please put your name on the signup sheet on the table in the Narthex and let us know what you are able to help with. We will also be selling mum plants as we did last year. If you wish sell your attic treasures and want to rent space (brining your own table and chair) it will be $25. If you wish to rent a table and chair from Grace it will be $35. If you just have thing you no longer want but they are still in good shape please bring them to church and place them on the stage as we will have a table for flea market items to sell. Sunday, October 14, 2018 – Please plan to attend the October Council Meeting. Council members will meet in the downstairs meeting room immediately following the worship service on Sunday, October 14th. Monday, October 15, 2018 – Our annual Conference Assembly will be taking place on the evening of Monday, October 15 from 6:30-8:30 at St. Matthew Lutheran Church, 400 Lynbrooke Road, Springfield, PA 19064. Friday, October 19, – Friday, October 26, 2018 – Pastor Richard will be on vacation. At present we are still looking for a supply pastor for Sunday, October 21st. Sunday, October 28, 2018 – There will be an Altar Guild Meeting immediately following the worship service in the meeting room downstairs. Wednesday, November 21st – We will be having a Red Cross Blood Drive from 1:00 – 6:00pm. If you are able to donate please let us know what time is good for you. Please ask your family, friends and neighbors to come out and help support the Blood Drive! This is a time of year when donations of blood are needed! There is a signup sheet in the Narthex if you want to help by donating blood or call the church office at 610-356-1824 and leave a message with the time you are available and we will return your call. Grace will be accepting donations for Autism during September & October. Linda & Butch Wetzel have provided printed material for those who would like to learn more about Autism. Also there is a poster of Mark, Josh and their mother, Denise. If you would like to contribute, please make your check payable to Grace Lutheran Church and on the memo line please put Autism. Offering envelopes are also provided for you if you prefer on the cabinet in the Narthex with the Autism material. Sunday, September 9, 2018 – Rally Day! We will be starting Adult Forum at 9:00a.m. and our Worship Service is at 10:00a.m. This is also God’s Work or Hands Sunday. We will be collecting items to fill small goodie bags for the children at Martin Luther Silver Springs School. This will take place during Adult Forum on Rally Day, September 10th and we will gather in the undercroft. We will need sandwich and/or snack size baggies, small fun size candy, small snack packages of pretzels, fruit snacks, animal crackers, crackers, small note books, small crayon packs, card games, stickers, etc. Try to avoid items/toys with strings longer than a few inches and small parts or sharp items. Sunday, September 9, 2018 – Council members will meet in the downstairs meeting room immediately following the worship service on Sunday, September 9th. Monday, September 10, 2018 – At 7:00 p.m. the Nursery School will have their Parents’ meeting in the undercroft. Tuesday, September 11, 2018 – The first day of Nursery School will start at 9:00 a.m.
Wednesday, September 12, 2018 – We will be feeding the hungry. If you are available please help with preparation in the church kitchen around 9:30 a.m. and/or help with serving around 6:15 p.m.
Bible Study led by Pastor Richard will begin again in the meeting room downstairs and we will be continuing to study the gospel of John. Please feel free to bring a brown bag lunch and a friend. We start around 11:30 a.m. on Wednesday, September 12th. Saturday, September 22, 2018 – The Service of Installation for Bishop Patricia Davenport, the newly-elected Bishop of our Southeastern Pennsylvania Synod, will be held at New Covenant Church, 7500 Germantown Ave., Philadelphia, PA on Saturday, September 22 at 2:00. Saturday, October 13, 2018 – Annual Bazaar – We will be having tables for rent at our Annual Bazaar this fall on Saturday, October 13th from 9:00 a.m. to 2:00 p.m. If you have a few attic, basement, garage or closet treasures you would like to donate we will have 2 or 3 tables that will profit Grace. Please place your clean items on the stage. If you have more than a few you can rent a table for $35 or bring your own table and just rent space at $25 so you can sell your treasures and make some extra cash for yourself or share a table with a friend. We encourage you to ask friends and other family members to see if they are interested in renting a table. We will also be renting tables to the public so if you are interested in renting a table please contact the church office at 610-356-1824 so we can reserve a table for you. This year we will not be serving lunch items but we will be selling mums, homemade baked goods and homemade soups. We need your help with making soup to be jarred and baked goods. We also need help to set-up, breakdown and clean. Also needed are people to sell mums, soup and baked goods. There is a sign-up sheet in the Narthex on the table.